The development of ultra short coherent soft X-ray pulses paved the way for applications like diffraction microscopy of nanometer structures, ultrafast pump probe spectroscopy, or the investigation of ultrafast atomic, molecular or magnetic phenomena. Of particular interest is high-harmonic generation (HHG). It is a small scale table top source providing ultra-short femtosecond light pulses in the VUV to XUV range. In this process a whole spectrum of distinct wavelengths is released concurrently in one beam. Many applications require this beam to be monochromatized and focused on a target. Here we investigate the optical properties (focal spot, diffraction spectrum, time dispersion and energy resolution) of a so called offaxis reflection zone plate (RZP) that meets these demands with only one optical element. To achieve this, the diffracted light was recorded with an Andor CCD camera. 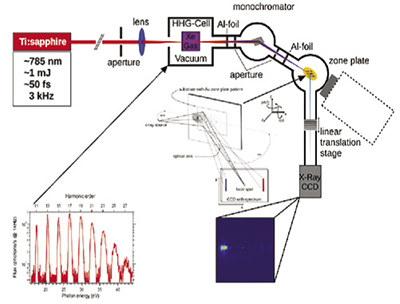 The setup consists of a Ti:Sapphire laser driving the HHG process in a Xenon gas cell. The relevant harmonic spectrum generated in our experiment lies in the range between 15 eV and 45 eV with three prominent peaks at 20.4 eV, 23.6 eV and 26.7 eV. Thus three RZPs were calculated for these energies and were fabricated on a total reflection gold mirror on a silicium substrate. Each RZP focuses its designated energy at the same distance and spot. The RZPs were mounted on a manipulator for alignment and to enable switching between RZPs. To image the resulting spectra and to investigate the optical properties the highly sensitive Andor X-ray CCD camera was used (Andor iKon-L DO936N-MW-BN). High sensitivity was necessary due to the low flux of a single harmonic. A shutter connected to the internal trigger of the camera controlled the beam and synchronized it with data acquisition. A RZP basically uses the same principle as the classic Fresnel zone plate, with two distinctions: it works in reflection mode (contrary to transmission mode of classic Fresnel zone plates) and its zone structure is not concentric but as if seen from an angle (here 30°), combining the dispersive properties of a grating and the focusing ability of the Fresnel principle. Fig. 2 shows a typical diffraction spectrum of one of the RZPs and the magnified focal spot. The desired harmonic is focused on the CCD chip whereas the other harmonics are focused before the chip (higher harmonics) or behind the chip (lower harmonics) and thus appear blurry. The chip consists of 2048 x 2048 pixels each measuring 13.5 μm². The large field of view provided visibility of almost all spectral lines/spots without needing to change the orientation of the RZP. At the same time, however the pixel size is small enough to measure reliably the spot size (100 μm - 200 μm) and the distance between harmonics to calculate the energy resolution and dispersion. By comparing intensities of the focal spot and the remainder of the spectrum a determination of the transmission efficiency can be completed. An approximation of the photon flux of the RZP focused VUV light was obtained as the quantum efficiency and and the exposure time was known.